Now despite getting and reading White Dwarf every month, I don't normally do a review of it. Partly out of laziness, and partly due to it not being needed - its out there, go read it!! However this month is different. 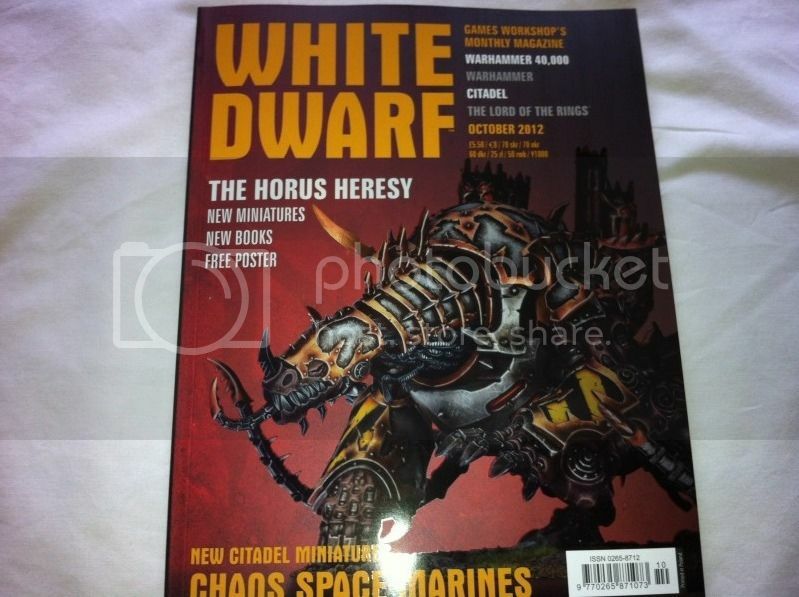 The new White Dwarf has been released with its new format and styling, the old version is dead. My copy finally arrived in the post (damn my crippled self, wanted it on Saturday damn it! Haha) and I figured I would give you all a run down of what it is like and my thoughts on it! 1. The price increase. Is the new book worth the £1(GBP) increase in price? 2. Is this book just going to be a shiner version of the same old catalogue that WD has become? 3. 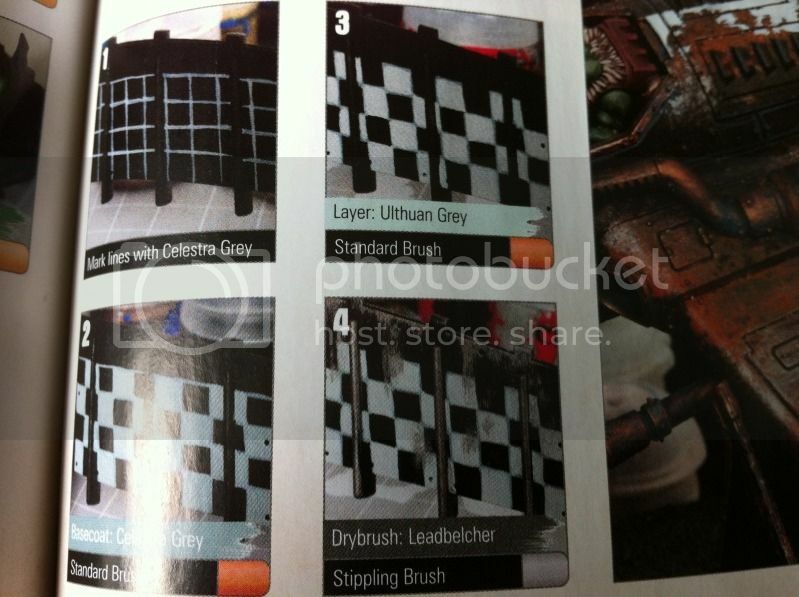 Will it really be geared more towards the hobby and the hobbyists like GW have claimed? 5. For someone interesting in the fluff element of the hobby just as much as the collecting, does White Dwarf finally engage you like it used to? Printed on higher quality paper and in a thicker paper cover the quality of the mag and the sturdiness are certainly much improved. The new matt finish with the gloss art work is a nice touch and adds a wow factor to the cover, something you want when looking for a hobby mag on your local new agents etc. 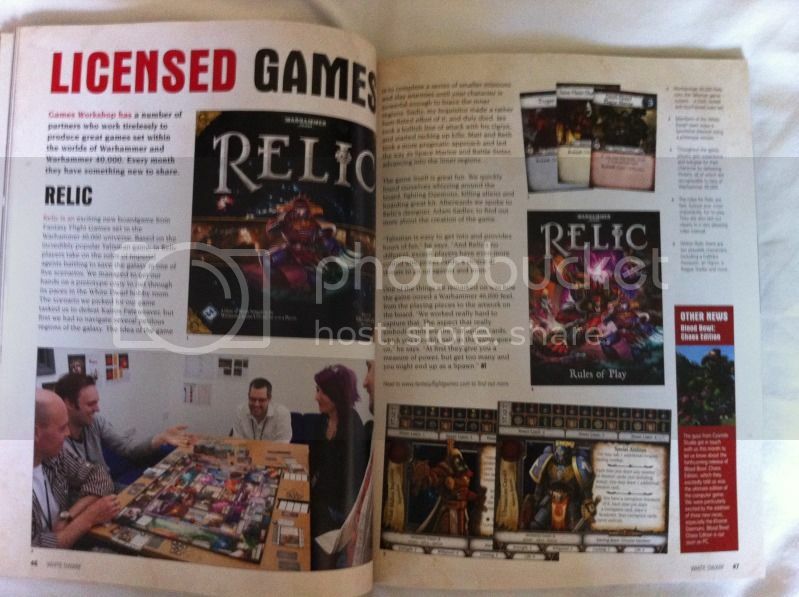 It draws the eye to the magazine and hopefully will get more people into the hobby through that alone. Something the old WD failed to do with the bland white cover with a bit of art and the floppy poor quality paper. Replacing the old "this a new product, this is the price - buy it!" section is a more detailed and less catalogue like miniatures gallery for the new releases. 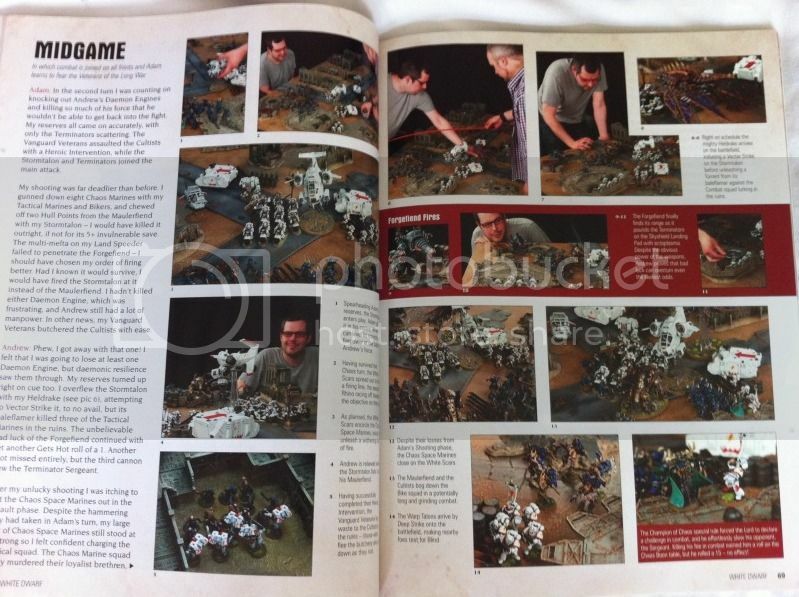 This contains some fantastic shots of the miniatures, both up close and on the table top. Each miniature gets its own description of the features of the model both in design and wargear load out. Also there is a lot more information about what comes in the sets, such as weapon options and pose suggestions, and information on how they go together. It gives you a proper look at the new kits and you can make a much more informed decision about whether you want them or not. 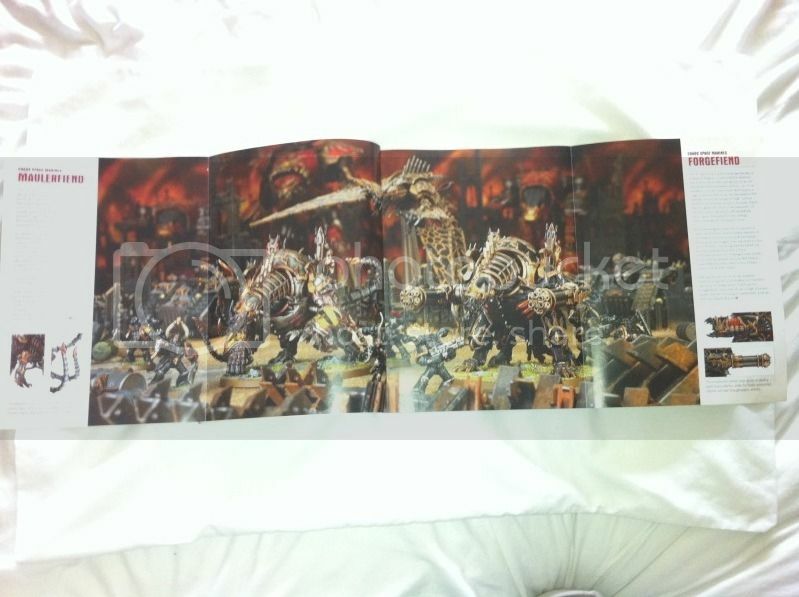 The two Fiend models even got a fold-out page section all to themselves! And the Drake got a double spread! 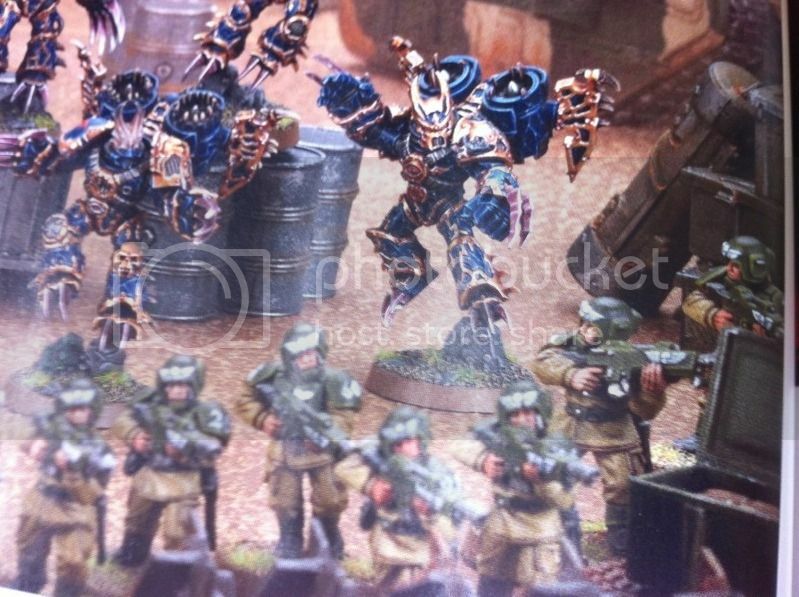 The Guardsmen on the right look pretty worried. - "Urm, Sarg?" Also included in the new release section were Forge World models and products with nice art work and photos of the miniatures. And Black Library and Licensed companies such as Fantasy Flight got a page or two to display their products and art work which was very nice. They have kept the pricing and product code information away from this area, which for me is a good thing, and listed it all separately in a 2 page spread. It feels much less like looking at a shop in book form and much more like an enjoyable celebration of some grand miniatures, with a foot note of "Oh you can buy this too if you want". Which I think it the best way for this to work, they are a business after all, and need to make money. But now they aren't ONLY telling us that this thing can be bought with one image of the box or whatever. They are allowing us to enjoy the models as any good hobbyist would, and then letting us choose whether to read the product purchase info. A feature I am very excited about and look forward to future editions of is the 'Army of the Month'. This is basically a section where a brilliant army, be it 40k, Fantasy or LOTR, is celebrated in all its glory. And this does not just mean the producers get some models out of the Games Workshops cabinets and show us them, no sir. The section celebrates our armies, the readers. They have stated it may include some of the producers/writers armies from time to time, which is far enough, but the fact they are making it about us, the customer is a nice touch. 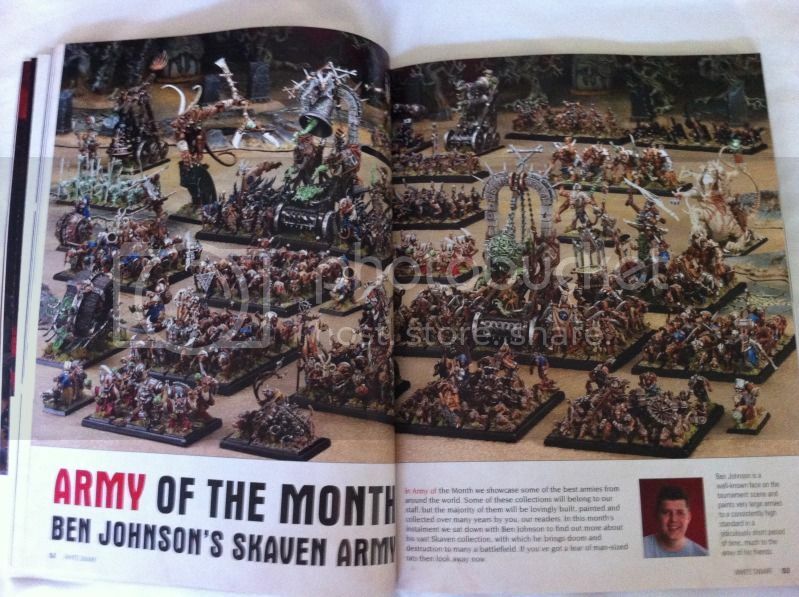 This month's episode showcased Ben Johnson's Skaven forces, all I can say is go and buy the mag and have a look. It's a beautiful army that has clearly had a lot of love put into it. Next up we had an Article from Jervis Johnson. He was discussing limits to forces in the rules, how it has developed over the years and the editions and what his feelings on the matter are. An interesting article that makes some very good points. Regardless of whether you feel there are too many or too few limits to what can and cannot be taken in your armies this article is worth a read. 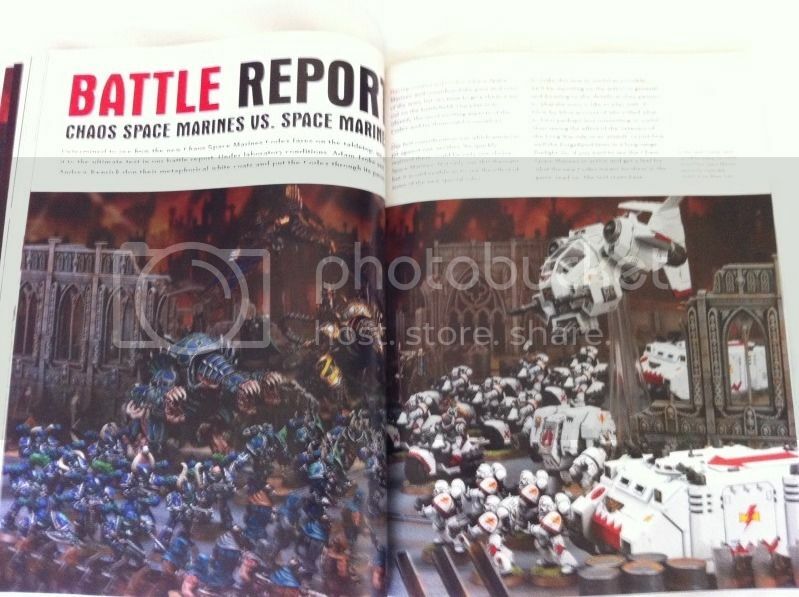 Now, one of the major parts of any Wargaming mag, the Battle Report. This month covered a battle between the Chaos Space Marines, commanded by Andrew Kendrick, and the White Scars Space Marines, commanded by Adam Troke. 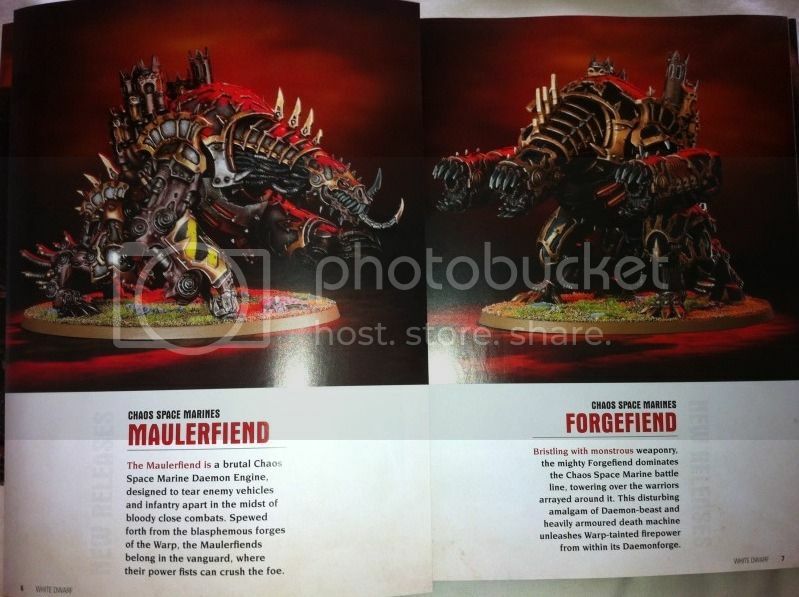 Whilst some of you may be saying "oh well it would be Chaos, the new models and all! What a sales ad that is" I happen to want to say "shhh you fewl". How can you really complain at this point? I mean if it was this time next year, a few 6th Ed codices were out and this wasn't the first new release of the edition I could accept the complaint. 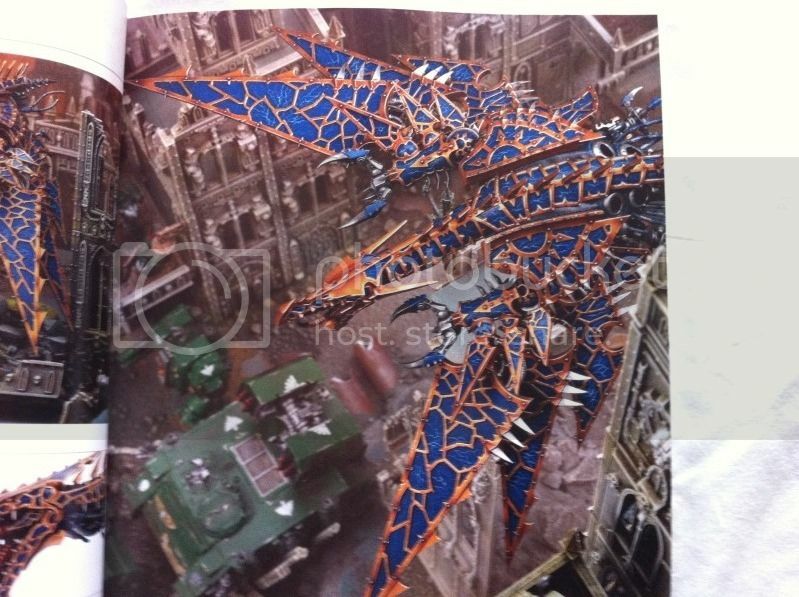 But considering Chaos is the first truly 6th Ed based codex what else would you want to read about? 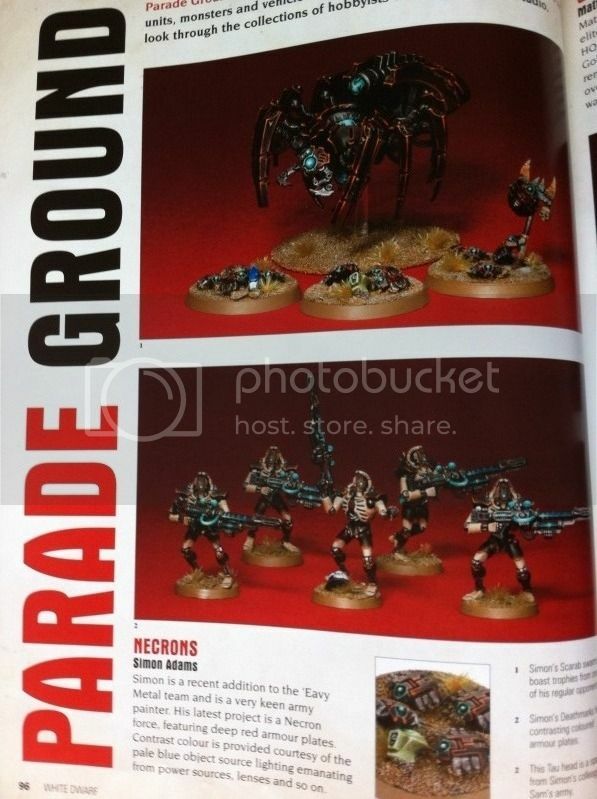 All the new rules properly coming into play, seeing how a 6th Ed army truly plays. Its a no brainer really. Chaos Marines HAD to be in there. One thing I did notice was the distinct lack of points that the units are weighing in at. For example, the Chaos Lord. 125pts as stated in the mag, and considering it just states one of the upgrades he has is 10, this leaves 115 points for the Lord, his kit, some sort of Aura and the Long War upgrade. HOW CHEAP IS THIS GUY! To get a marine captain with just a plasma pistol and power sword its 130........ This will be interesting to find out once the dex is out, getting pretty excited to be honest. But anyway, this pulls away from the point of this article. The White Dwarf mag its self. The run down of the two forces were concise but informative and I think it was a fairly even match up. The photos of the armies were nicely done and good quality as always. When it comes to battle reports I usually prefer them to be in a turn by turn presentation with overview maps and full descriptions of the goings on in each player turn including arrows and graphics to represent said goings on. This is just my personal preference. This battle report was not like this, at all. It had a 'Deployment', 'Opening', 'Midgame' and 'End Game' followed by a 'What We Learned' and 'Post-Battle Review'. See this I went in to the reading with a slightly negative attitude, not good when trying to report on what is there regardless of personal preference. But I was pleasantly surprised to find I didn't mind the way it was done. The 'Deployment' section contains all that was needed to explain why units were placed where, who got to place what when, and also what the mission was and what it entailed. Also a nice picture of the deployment was presented to make the description nice and clear. The 'Opening' and 'Midgame' sections were detailed in what was going on, well as far as they could be with out a move by move run down. The only issue I had with it was that the pictures were a little small. You could see what has happening, but I can't help but think they could have used a bit more size. The 'Endgame' section was okay, but reading it through it feels like it was rushed. There doesn't seem to be enough emphasis on the really gritty art of war and what has happening in the closing stages of the battle. Particularly the battle between the Lords. The insight that the players got from playing is well represented in the 'What We Learned' section, with both players giving their views on key points. The 'Post-Battle review' is a section where they had three independent people comment on the battle. In this case it was the Chaos Codex Author Phil Kelly, White Dwarfs Photo Editor Glenn More and the White Dwarf Lead Designer Matt Huston. It was nice to see what some people who watch thought, gaining insight and tactics that is not through the eyes of the players can often give you knowledge and information to take away that you would never get from the people controlling the armies. After all, they always want theirs to be the best. It is how it works. Following on from the Battle Report is the Rivals section. Here two veteran Warhammer Fantasy players discuss their favourite armies and why they choose them as well as some tactics involved. This edition saw Martin Morrin discuss his Dark Elves and Adam Hall his Vampire Counts. I assume this section will feature multiple different faces and races from across all the games Games Workshop systems, which will give everyone a good look at armies they perhaps don't know much about. I enjoyed reading this one as personally I don't know a great deal about either of the presented armies. It has good insight in to why the players build their armies the way they do and with this comes information about the armies as a by-product. Such as what they are good and bad at and the powers they have. The next big section of the mag is about the Horus Heresy. It runs down a brief history of the Heresy and suggests literature from Black Library that we may be interested in reading to learn more. 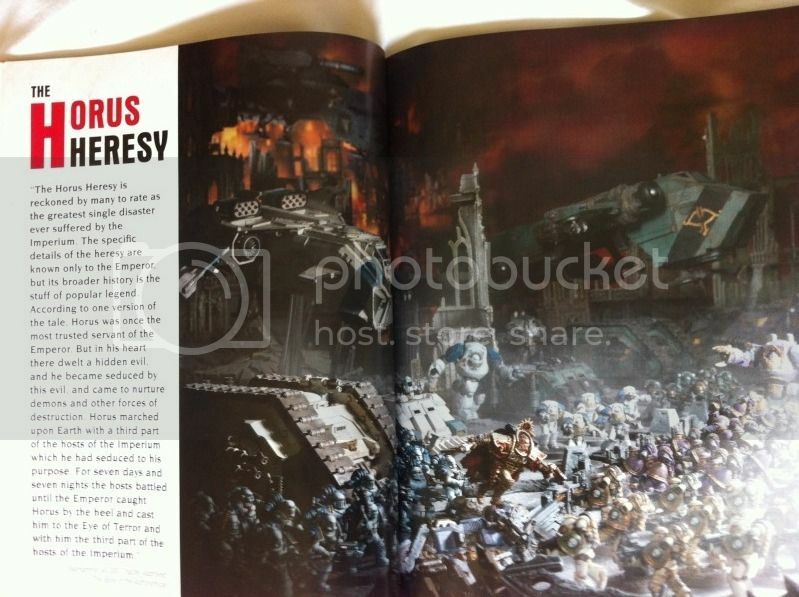 This section seems to be more about getting us hyped about the up coming Horus Heresy book from Forge World. And I have to say, it does a damn good job! 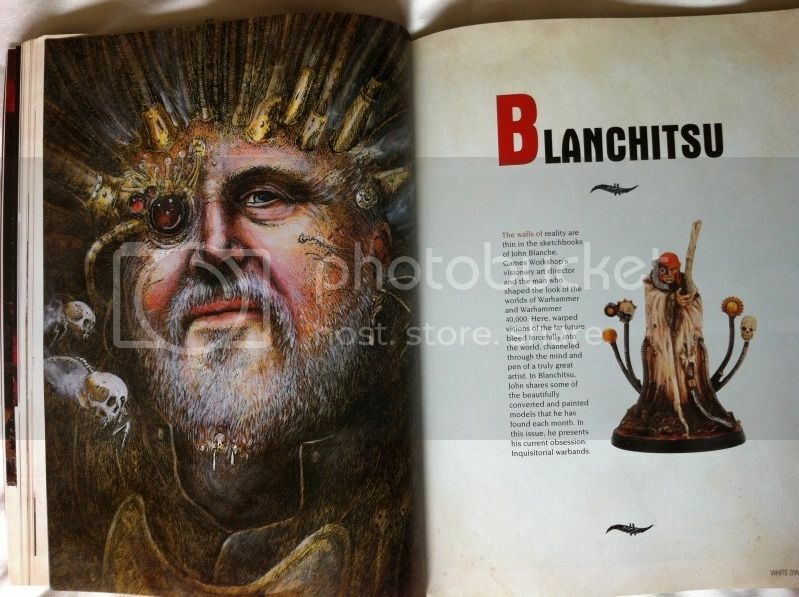 Between the stunning images to show off miniatures you can't help but love and the tid bits of information about the Heresy, the book that is coming out, and the range of new things you can do with it just gets the mind swimming with ideas for new armies or amendments to your current ones! A joy to read and a joy to look at. Following on from this is a section on John Blanches brilliant works along with an amusing self portrait he did of himself. These were a couple of really inspirational pages. Filled with nothing more than one artists ideas and work relating to the hobby. Next up we have the 'Parade Ground' and 'Kit Bash' sections. The 'Parade Ground' section describes its self as a monthly feature that takes a look at painted units united by a single theme. It celebrates some fantastic miniatures, some brilliant paint schemes and the work that goes into them. From posing the model to the shading in the paint its a brilliant section to read through. The 'Kit Bash' section describes its self as a monthly article taking a look at converting. 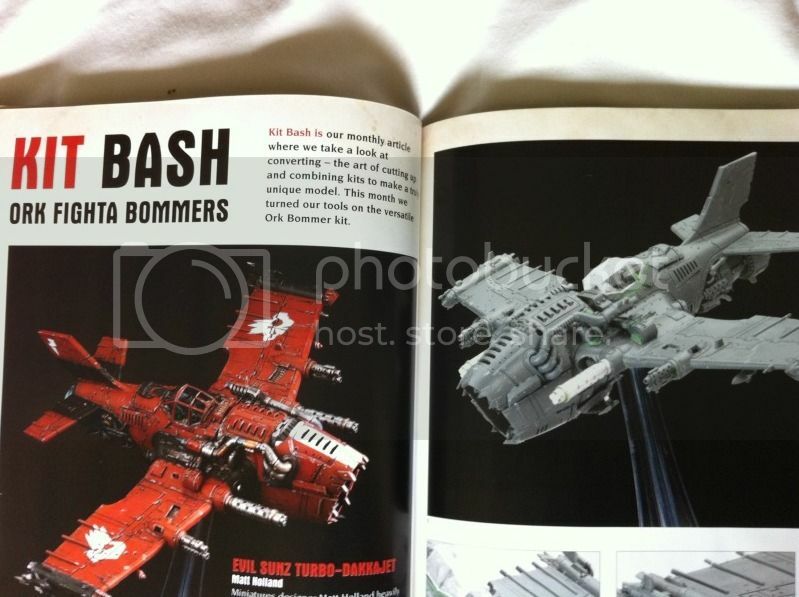 This month it was looking at the Ork Bommer kit. 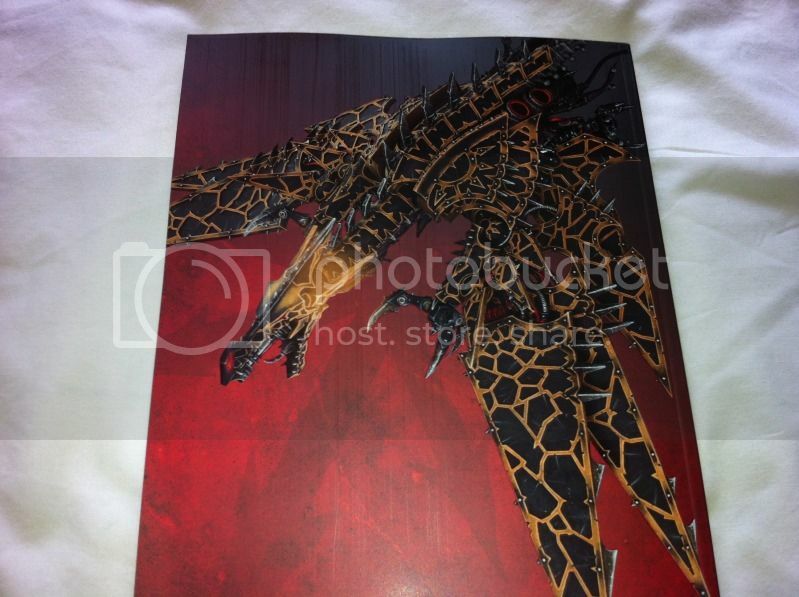 Also including in the new mag is the Paint Splatter section. This area basically gives you tips on painting styles, colour ideas and general tips on method and application of paint to your miniatures. After this and through to the end of the mag we have what's coming up this month at GW:HQ and other GW offices such as the design studio, the hobby Calendar and also another article from a member of the team. All in all I am impressed with the new format of White Dwarf, the quality is much improved, the lay out is much improved, the content is much improved, basically its just a better hobby magazine now! So, to look at the points mentioned earlier! I would say yes, it is. The quality of the whole thing is much better. Not only from a physical stand point with the paper, but also the content and the thought that has gone in to it. I'd have to say no. Whilst yes it does market the new products, this is to be expected. It doesn't ram nothing but the price and the product codes down your neck. 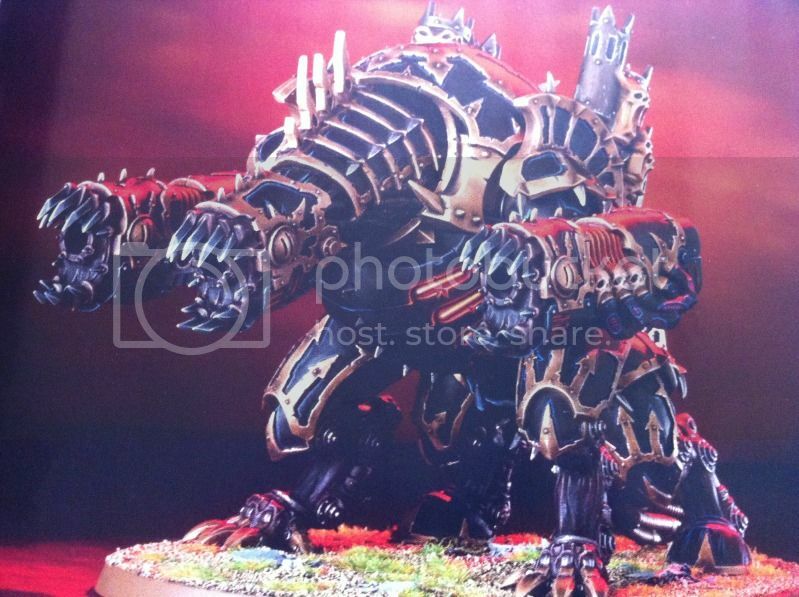 Games Workshop are a company that makes models and they need to sell them to keep open. But they have moved to showing us, the hobbyist, the thing we want to see. The models and art work as well as the information that goes with it. The sales pitch bit is missing more or less completely, and all that is present in that regard is the list of prices over small 2 page section. Not a lot in a magazine with 151 pages. Yes, they really have. This is the most hobby orientated edition of White Dwarf I have read in a long long time. In fact, not since reading some of the very early editions I got my mitts on did I have as much fun. From the model info, to the story tid bits right through the painting and converting sections the mag was a pleasure to read as a hobbyist. For one, White Dwarf is hardly unpopular. This is crazy talk. For two, people still do. Why else do you see news stands FILLED with mags of various sorts? Again, crazy talk. And just to put this to bed once and for all, look at the electronic version of White Dwarf and how well it is doing in the iStore......so, now that is sorted out go back to your padded rooms. Crazy people. As said earlier, yes it does. A pleasure to read and some engaging and interesting articles and sections. I look forward to reading more editions of this new White Dwarf. 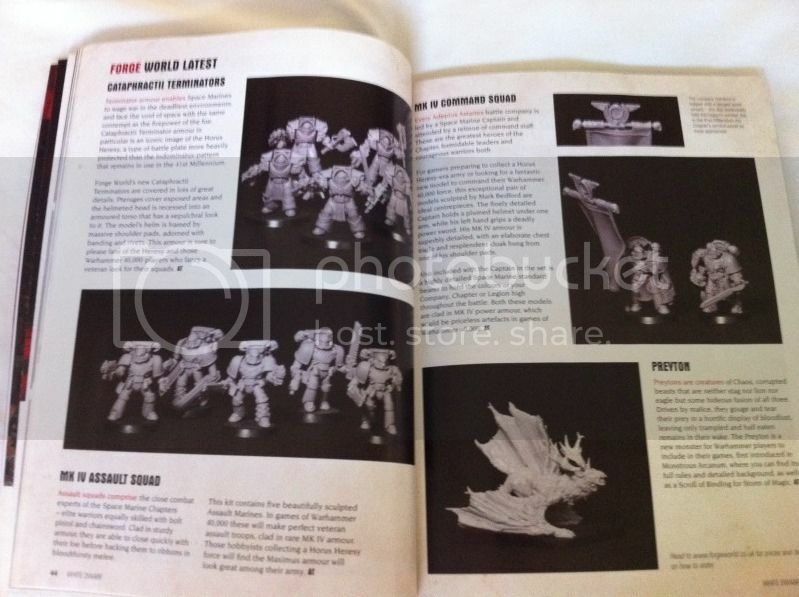 So there you have it folks, my thoughts on the New White Dwarf mag from Games Workshop. I have by no means covered everything the mag has to offer, nor do I intend to. If you haven't already I suggest you go pick up a copy from your local store or order one on-line and have a read. It will be worth it. I'd love to hear what others thought about it, and if you think I have missed anything out or got anything wrong. Leave me a comment below with your thoughts. Thanks for reading and happy hobbying. Not sure that I will start reading it again, but always good to know that they look to have changed things. Cheers Skal. Hope it was informative enough.